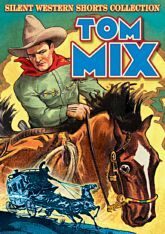 The silent screen's King of Cowboys, Tom Mix, also had a knack for knockabout comedy, as seen in these six shorts from the mid-teens, five co-starring his future wife Victoria Forde. CACTUS JIM (1915): Ranch hand Tom advertises for a wife and a Chicago shop girl accepts�but, later declines. To avoid being ribbed back at home, he tries to pass off a female mannequin as the missus! THE AUCTION SALE OF RUN DOWN RANCH (1915): At a ranch auction, one bidder has the misconception that the land is oil-rich and pays $5,000. Once he wises up, the cowpokes must prevent him from stopping payment on the check. 5,000 DOLLAR ELOPEMENT (1916): While Tom and his girl elope, a pair of varmints rob her home. Tom abandons his new bride and heads off in hot pursuit. LEGAL ADVICE (1916): Tom falls for a lady lawyer and shoots up the town�hoping she'll bail him out and put him in her custody. LOCAL COLOR (1916): Author Vicky arrives at a Western dude ranch to soak up some atmosphere for a story. To give her a thrill, Tom poses as a gun-crazy desperado. AN ANGELIC ATTITUDE (1916): Tom falls for a newcomer to the West, a pretty artist named Grace�but, he has an unexpected rival.